A few months ago they released She’s Big in Egypt, a collection of diverse original compositions highlighting the elegance and versatility of brass. Now the CC Septet takes on the holidays, and particularly some of the season’s most beloved songs and carols, rearranged as should-be jazz classics. The Septet celebrates We Three Kings and a Horn Section on a double bill with vocalist Jennifer Grimm at the Dakota Jazz Club on December 15th. 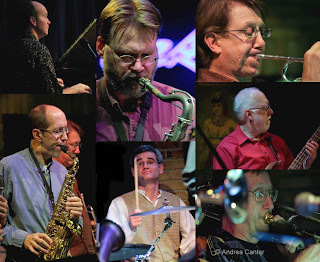 The CC Septet includes musicians connected one way or another to Century College in White Bear Lake: Tim Lackas, piano; Greg Stinson, bass; Brett Smith, drums; Ralph Brindle, trombone; Paul Peterson, tenor sax; Larry Neumann, alto sax; and Scott Snyder, trumpet. And while White Bear Lake might be an unlikely wellspring of jazz chops, the CC Septet has repeatedly defied expectations, largely due to a spirit of team creativity that is fundamental to the septet’s sound and longevity. Unlike their first two albums, We Three Kings is entirely familiar material, arranged by band members as uptempo swing, jazzy ballads, and funky grooves. “Rudolph” (arranged by Tim Lackas) initially sounds a mournful blues via Scott Snyder’s trumpet and morphs into a swinging sleigh ride with a zany undercarriage of racing bass and saxophones. The red-nosed Rudolph might well have trouble keeping up with these reindeer games! As they so often do, the septet sounds like a big band on fire. Switching gears dramatically, Greg Stinson’s arrangement of the traditional “Sussex Carol” highlights beautiful harmonies with celestial touches from Lackas’s piano. Lackas’s arrangement of “Little Drummer Boy” gives “drummer boy” Brett Smith plenty of room to show off his talents with plenty of support from soprano sax (either Neumann or Peterson), while Lackas’s bluesy arrangement of “Mr. Grinch” puts the trombone in the spotlight, courtesy of Ralph Brindle’s tipsy, spoiled-sport whines and growls. His closing muted statement is both hilarious and utterly dark. “Coventry Carol” as arranged by Stinson is a clever, effective paradox of funk meets hymn, brightened by sax solos interspersed among the solemn melody lines and elegant harmonies. Another Stinson arrangement, “Silver Bells” opens with Lackas swinging at the keyboard, while Scott Snyder sneaks in a few licks straight out of Preservation Hall. Paul Peterson handles the arranging on “We Three Kings,” drum and bass introducing the tune with funk and soul, heightened by Lackas switching to organ. The next two tracks seem reversed relative to their usual moods, with Lackas’s “Silent Night” presented as a joyous bop buoyed by Snyder on flugelhorn, while Paul Peterson gives the normally upbeat “Santa Claus is Coming” a contemplative overcast. The final two tracks showcase the jubilant majesty of brass, “Joy to the World” (Stinson) and “God Rest Ye Merry Gentlemen” (Peterson). You can spend an evening with these Merry Gentlemen at the Dakota on December 15th, 7 pm. In addition to the CD release, they will share the stage with Jennifer Grimm, bringing her sultry alto to music from her holiday release, Christmas With Family and Friends. Enjoy this double dose of holiday spirit! 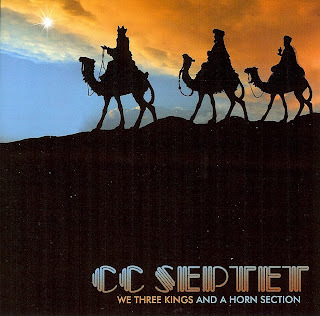 If you are interested in purchasing We Three Kings and Horn Section (CDs make great gifts! ), email the band at ccseptet@gmail.com. Or better, go to the CD releaese party and get it first hand!